Audioquest VDM-1 review | What Hi-Fi? Smooth and stylish, this is a good all-rounder. Without casting aspersions on the fine cables at the budget end of this group, the AudioQuest instantly feels superior. The snakeskin style design covers a two-layer silver-plated shield, itself on top of a hard cell foam that protects the all-important conductor. All this means little if we don't like what we hear, but thankfully the VDM-1 reveals a pleasing, refined sound. 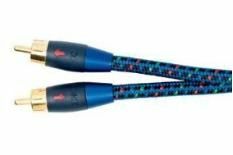 Perhaps unsurprisingly, the cable does lack a little bite at times, but it remains a smooth operator.